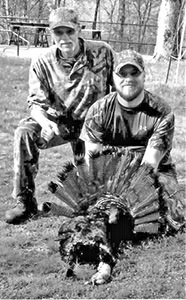 Wounded Warriors in Action Foundation (WWIA) is holding another great hunting event for Purple Heart recipients on April 8-11, hosted by Shelley Cohen and Dennis Reynolds, on their property at the edge of Lewis and Wayne counties. Lynn Tiller of Hohenwald, back, volunteered his time in 2015 assisting the Wounded Warriors as a guide for the hunt. On this all-expense-paid trip, Heroes John, Chance, Justin, and Jonathan will be out hunting turkey for two full days from ground blinds. While the harvest can be exciting, the main event on this trip is the opportunity to connect with other Purple Heart recipients and be enveloped in the warmth of thankful and caring hosts. Wounded Warriors frequently return home different than when they left to serve our Nation—life in general and their personal and professional lives have changed dramatically. WWIA strives to show these Heroes they can still experience and accomplish milestones in their lives, no matter their current circumstances. Critical to the healing process, whether from traumatic brain injury, permanent limb disability or post- traumatic stress disorder, these events bolster self-confidence while strengthening the bond with nature, local communities and other Purple Heart veterans. Each WWIA event serves three to five Heroes and lasts at least two to three full days, allowing for optimal bonding, brotherhood and camaraderie. Wounded Warriors in Action Foundation (WWIA) is a national non-profit dedicated to serving our nation’s combat wounded Purple Heart. For more information, please visit www.wwiaf.org, like us on Facebook at facebook.com/wwia or contact us at info@wwiaf.org.